Caged No More – Inspired by real events! The story presented in this Christian DVD is quite powerful. It has a similar situation of human trafficking like the one is shown in the Christian movie Priceless starring Joel Smallbone from the band for King & Country. Caged No More sheds some light on a topic that isn’t quite talked about, especially in movies. It’s sad to even think that so many people, millions of innocent people are captured and thrown into trafficking and enslavement. 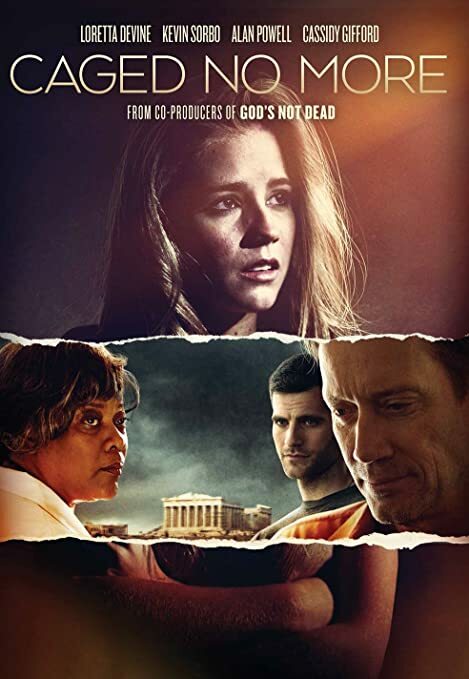 Apart from the important storyline, this Christian movie has amazing actors that also have been a part of other faith-based films like for example Allan Powell from The Song. Caged No More is a story inspired by real events and it tells the story of a grandmother who is eagerly trying to locate both of her granddaughters, Skye and Elle, who apparently have been kidnapped. There’s a difficult situation right at the beginning of the Christian movie Caged No More as we see Aggie Prejean (played by Loretta Divine) holding Macy, her goddaughter who now is moments away from taking her last breath. This moment is quite painful for Aggie since she has a very deep love for Macy and her daughters. Macy’s last words are imploring Aggie to save Elle and Sky from Jack. At first, Aggie isn’t clear as to what Macy was trying to say but is set on discovering what was it that her goddaughter meant. Aggie begins doing some research and finds out that Jack is actually Macy’s husband and immediately aggie suspects that he’s the one who has taken both Elle and Skye. Jack is indeed a drug addict and is pushing himself deeper and deeper in debt. He owes some money for drugs and when that time to pay up comes he still doesn’t have enough money to pay the dealer back. Now his life is on the line so he chooses to kidnap both his daughter and sells them into slavery somewhere far. With this, he hopes to be able to pay his debt in full. Now, Aggie has to stop this and save those girls and now more than ever that she promised Macy. Aggie continues to do research about Jack and she finds out that he has a twin named Richard. Jack’s twin is quite the opposite of him, he’s indeed wealthy and helps many entities. He’s a very respected person because of all his help towards different charities. When Richard is informed of his brother’s horrible act of kidnapping the girls, he feels that he has to do something and immediately uses whatever resources he has available to bring Skye and Elle back safely. Needing more help, Aggie and Richard also ask Wil, Richard’s son, to help them thinking he will be of great help since he was a member of the Special Forces. Both Richard and Wil are stunned at all the horrible things Jack is doing and they make an even stronger commitment to bring the man to justice. Both men have a rescue group that focuses on human trafficking and they all head to Greece where it is believed to be the location of the girls. Aggie turns to the One who can help and it is comforted by God’s peace. She is constantly praying for strength and praying that those headed to Greece stay safe and that they can get there in time to stop Jack and get the girls back. Also constantly praying is the church that Richard and Wil attend. They organize in a group and are always thinking of the mission that is happening. Also, the church is set to inform others of the horrible and real industry that is human trafficking. They want to make a difference in their own community and shed some light on this situation. Richard and the rescue team get closer to where the girls are but Jack is very close to selling his daughters. Aggie continues to pray on one side and the girls are holding onto God as well. They’re so close but yet don’t know exactly where they’re headed, only God can lead them. Will Aggie, Richard and the rescue team find Sky and Elle? Will they get there on time or sadly too late? What will happen to Jack?